Naturally dyed Easter eggs are a beloved tradition. Coloring and decorating the beautiful eggs are as much fun as hiding them and finding them later. However, the brilliant colors don’t come cheap: The dyes have harmful chemicals that can create a toxic environment and be detrimental to you and your family’s health. No matter what your favorite blend is, you can brew a strong batch of black or green coffee and dip your eggs in a quart. There should be enough coffee to cover your eggs completely. The longer you leave the eggs to soak, the more intense the color will be. Put your eggs in enough water to cover them and add about a quart of blueberries (more if you want a more intense color). Add one teaspoon of vinegar to deepen the color. bring the water to a boil, then let it simmer for 15 minutes. For a beautiful pink or reddish hue, strain some cranberries and let your eggs soak awhile. You can add vinegar to help intensify the color. As with your other natural dyes, the longer you leave the eggs to sit, the deeper the color will be. This can be a fun exercise to do with the kids too. Get a bucket of fresh cranberries in the backyard and let the kids take off their shoes and juice the cranberries themselves. The rich yellow color of this spice makes some lovely golden eggs. Mix a tablespoon of turmeric with a cup of water, and soak an egg or two in the mix. You can add more turmeric for a thicker paste and a deeper color. Red cabbage leaves can make beautiful blue eggs. Simply boil the leaves, then wrap each of your eggs individually. You can use string to create nice striations in the design. 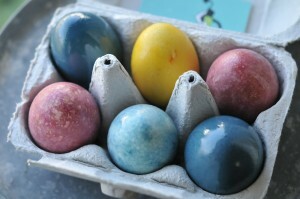 There are many more natural dyes you can choose to create beautiful eggs. Bold-hued fruits like berries are a great choice, as are vibrant spices like paprika and saffron. You can even crush your fruits or veggies and rub them directly onto your eggs for detailed designs. Experiment with what’s in your refrigerator and create some stunning and healthy eggs for your Easter celebration. 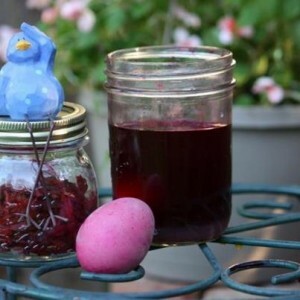 Do you use natural dyes for your Easter eggs? Share your tips and suggestions in the comments! Bridget Sandorford is a freelance food and culinary writer, where recently she’s been researching Japanese cookery courses. In her spare time, she enjoys biking, painting and working on her first cookbook.